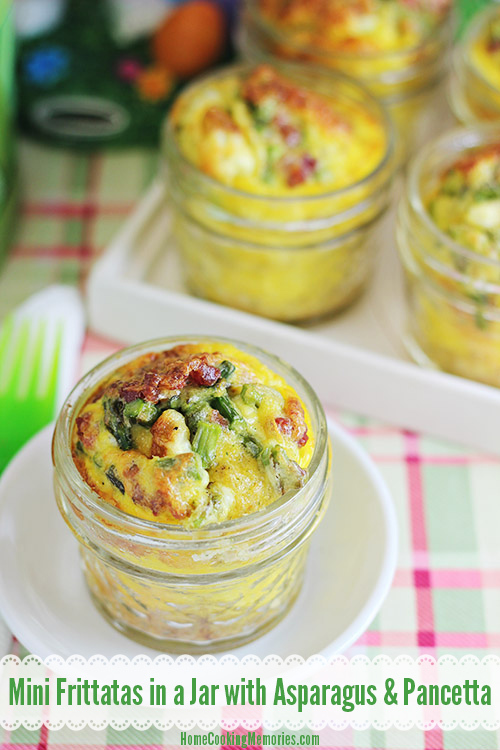 Springtime is here and these Mini Frittatas in a Jar with Asparagus & Pancetta recipe are a delicious idea for your Easter brunch or Mother’s Day brunch. Can you believe it’s just over 2 weeks until Easter? I knew it was coming, but I didn’t realize it was so soon. I usually like to decorate about a month before any given holiday, but I’ve been so slow with Easter. David is the designated get-down-the-holiday-stuff person and he brought me in one box today so I could put a few things up. But, when I opened the box, most of the space was filled with Easter baskets. EIGHT of them. Please tell me why we have 8 Easter baskets? We have 4 kids and we put together 4 baskets each year. I can’t even remember when I bought them. While I might not be the best at getting the holiday decorations up on time, one thing I’ve got covered is the holiday menu planning. Our Easter menu is pretty well set, and ohhhh yesss…I can’t wait! Makes me hungry just thinking about it. While most of my cooking on Easter Sunday will be for dinner, I do have a few things planned to enjoy for brunch after the kids hunt their Easter eggs. 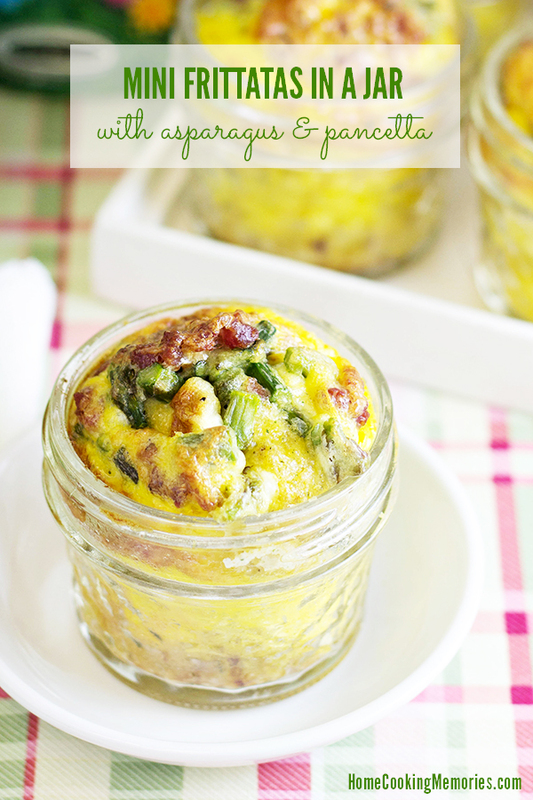 Today I’m sharing one of them: Mini Frittatas in a Jar with Asparagus & Pancetta. 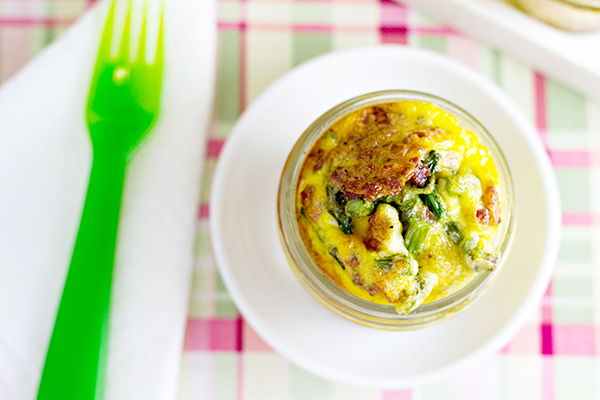 I think these frittatas are so perfect for Easter brunch — not only do the ingredients say Spring, but they are baked AND served right in the jars which are so much more fun than eating something on a plate (not to mention: less to clean up). Oh, and best thing yet — the name! FRITTATA! If I had a favorite word, frittata would probably definitely be one of my top favorites. These frittatas are made with eggs, of course, and several other delicious ingredients: asparagus, diced pancetta, parmesan cheese, and breadcrumbs. The eggs are beaten and Parmesan cheese is added to them. Breadcrumbs are combined in a bowl with some melted butter and pressed into the bottom of each 4 ounce canning jar. Then, egg mixture is poured in each, and finally they are topped with some of the asparagus and pancetta. They are baked in the oven and when they are finished, you’ll have your cute, little puffy frittata! Won’t those be fun to eat on Easter morning? Spray 9 canning jars (wide mouth – 4 ounce size) with cooking spray or grease lightly with butter. Place jars, evenly spaced, on a baking sheet. Cut tough ends off of asparagus and discard. Cut remaining stalks into approximately 1/4″ pieces. In a skillet over medium heat, cook pancetta until beginning to get crispy and completely cooked. Remove from heat and with a slotted spoon, remove pancetta to a bowl. Drain off all but 1 tablespoon of grease. Over medium heat, cook asparagus in grease over medium heat until tender-crisp, about 3 minutes. In a large bowl, lightly beat the eggs with the salt, pepper, and milk. 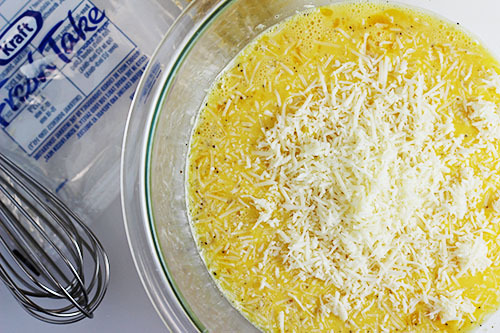 Whisk the cheeses into the eggs. In a small bowl, combine breadcrumbs with butter. Spoon about 1 tablespoon of breadcrumb mixture into the bottom of each canning jar. Gently press mixture down. If any excess breadcrumbs remain, divide remaining amount between all jars. Pour approximately 1/3 cup of egg mixture into each canning jar, directly on top of the breadcrumbs. Top egg of each canning jar with about 1 tablespoon asparagus, followed by 1 teaspoon of pancetta. Once again, if any is left after filling all cups, divide among jars. Bake in oven for approximately 10-15 minutes, or until top is browned and a knife comes out clean when stuck in the middle of one of them. –1 cup of shredded Italian cheese blend (that contains mozzarella and Parmesan cheese) can be substitute for the individual cheese ingredients. –If you prefer, you can make this recipe without the breadcrumb layer. Simply skip the breadcrumb and butter ingredients/steps. –I recommend keeping to 1/3 cup egg mixture in your jars, but you may find that you have a small amount of egg mixture leftover after filling all jars. If you wish, you may add the remaining mixture to jars, but the mixture may bubble over more. 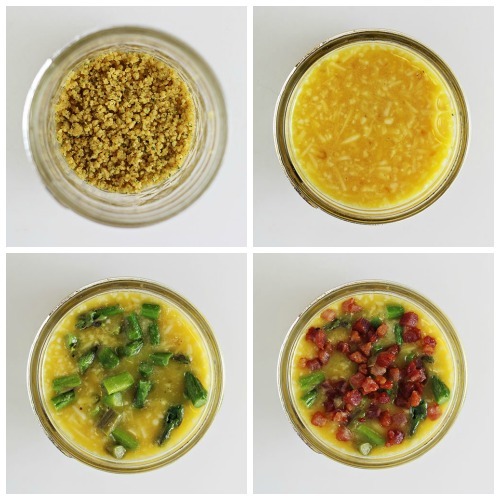 –These frittata in a jar are intended to be consumed after cooking. Due to the egg puffing up higher than the edge of the jar, it usually won’t work to put the lid/ring back on the jar for storing in the refrigerator. 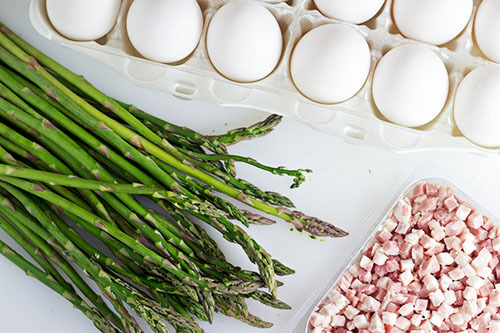 If you wish to do this, you will want to use less egg and/or asparagus. 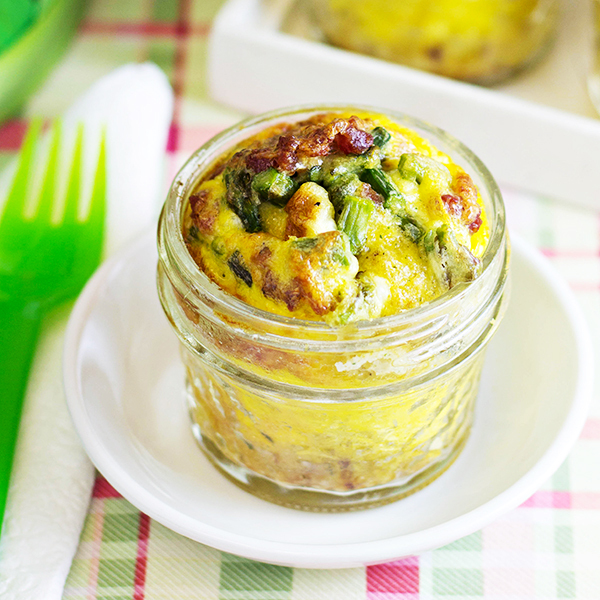 I hope you enjoy my Mini Frittatas in a Jar! I’d love to hear how you like them…and if you have other ingredients you love in frittatas, leave me a comment. I can always use new ideas. Disclosure: I am a member of the Collective Bias® Social Fabric® Community. This shop has been compensated as part of a social shopper amplification for #CollectiveBias and its advertiser. I love everything about these! Great idea!!! Thanks for linkin’ up with What’s Cookin’ Wednesday! These would look great on the table for Easter Brunch and would make it look like I spent all day making them but in reality, they’re really simple 🙂 Pinned! I love these!!! I love frittatas but never thought to make them in a jar! How fun for a picnic! Thank for sharing! What a fun idea! I wish I had a ton of those little canning jars so I could do these for my Easter open house! I made these and they turned out wonderful! They make a stunning presentation. I made them in my ramekins instead of the jars. Just bought the ingredients to make them for my daughter and family who are coming to visit for the weekend. This is a new favorite and works for breakfast/brunch/lunch or dinner! Thanks for sharing! These are SOOO cute! Love frittatas. This look delicious. I am always looking to incorporate asparagus in food. This is nice recipe with it. Ohm goodness. They are so adorable. I hope you don’t mind that I shared them on Sulia. These would be a perfect recipe for any brunch potluck. I can’t wait to give them a try.. I don’t mind at all…thank you so much, Marlene! do you think it would work with out he bread crumbs? ?